Welcome to AR15 Hunter, Tim! Do you have access to hunting property? Btw, I'm moving to Idaho in about a year, so you will have company! Past few years I've done the public hunting areas. Only a couple that allow for anything other than dove it seems. Hoping to get a good piece of Idaho (or Alaska) with my own property to hunt or backing up to state land to hunt on. For now I will keep at it! New to the forum. Long time shooter and hunter but fairly new to AR's. I work in the Public safety sector. We put the wet stuff on the red stuff. Looking forward to enjoying the knowledge and learning from the group. I'm all about putting meat in the freezer. Venison,hog, you name it. Also all about protecting the venison that's running around my place via predator control. Greetings from Big Sky Country. My focus on the AR platform has been as a defensive tool, but due to the inherent versatility of the platform I've harvested rabbit, ground & tree squirrels, prairie dogs, Coyote and assorted vermin with an AR15. As mentioned above, I've also harvested Mule Deer & Whitetail with AR15s though I haven't utilized an AR for big game hunting in about a decade. I'm amazed at how the firearms community has come to embrace the AR15 as a worthy arm in the hunting arena. My belief is that has a lot to do with the commercial success the AR has enjoyed since around 2008 and the additional chamber offerings. It's been a welcome trend as the AR15 is the Right Arm for America in my opinion. Thanks for the invite Will. Glad to see you join. Another hello from Big SKy Country! I have a serious case of BRD. I love building them, loading for them, training with them, and shooting them! I got a late start in hunting, but have been after it for a few years now. Took my first whitetail does a couple years ago with my Father's R700 .243 that was handed down to me. Then I found a buddy that was very in to the AR platform, and a couple years later I have 4 rifles in 3 calibers. Last year I took my 18" 6.8SPC Antelope hunting but was not given a shot within the range I felt comfortable with. (used my .30-06 the next day) I plan on using it again this year for Antelope and whitetail hunting. Yesterday I broke in my .277 Wolverine with 100 rounds of 90 Gr SPeer Gold Dot hand loads, and it look very promising for sure. I also have a .223 Wylde that shoot .550 moa groups with my 69 SMK handloads as well. (shown below) I use ar15performance (or ARP) barrels exclusively for my own personal builds and build for friends as well. Our state legislature finally passed big game suppressor hunting into law up here in MT, so I am getting as much experience behind my YHM Phantom-Ti as I can. 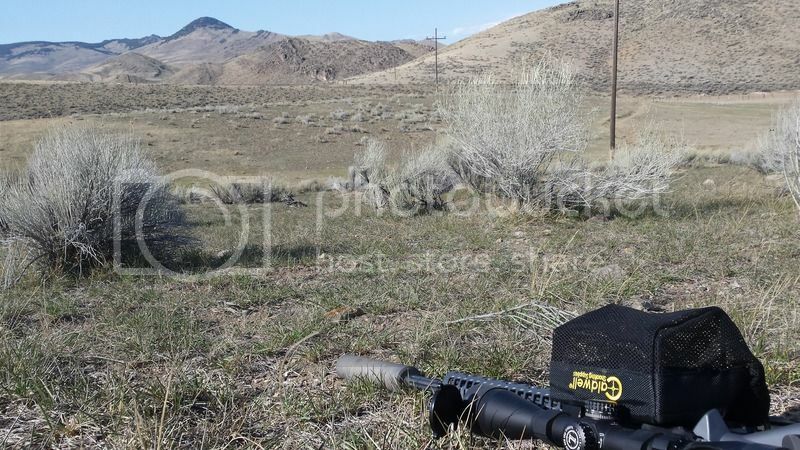 Here's a shot of some early spring gopher hunting in the Big Hole area of Montana. we destroyed them that day. Nine active shooters who only stopped shooting to reload or take a break! Love all the reviews I have read/watched on the website, so I thought I would come along for the ride! We look forward to your posts. Good luck with the Antelope and Whitetail this year. I'm planning on taking my .277 Wolverine out this year for Whitetail. Brand new here. Caught BRD a couple years ago. Have 4 now with 3 projects to start on. Gearing up for a pig hunt, soon I hope. Thanks in advance for the expertise and help on this forum. My latest build is a FA F17. Aloha ar15 hunter . My name is Joey . My name is Jason. Born in Texas, but currently living in KY. Found the site after looking into the Franklin Armory 17WSM. I have to admit that I got an error the first time I tried to register. What's shaking guys, new here,i live in Arizona and this going to be my 1st year ever using an Ar for hunting. Pretty excited, I just got a new 300 blackout setup! Just hope my name gets drawn here for the lottery. Hello all. New here but I recognize a few names. Thinkin on a new AR and thought I might gather some info here. My name is Brian Kinney, and I am very glad to have found this site and hope to see it grow and promote all things AR related. I've been hunting since I was 10 with all manner of rifles and shotguns from single shot to semi-auto's. I recently got into AR's after shooting a couple owned by friends and admiring how fantastic a platform this is for hunting due to its accuracy, ergonomics and inherent all-weather durability. As a coyote hunter in Michigan, we are stuck with rim fires only for our nighttime hunts, so I am very interested now in assembling a rifle using a Franklin Armory F17 v4 upper. Problem is not a lot of info out there regarding set ups, only complete rifles. So if any of you have one, help a brother out and post up info! New to the forums here. I have been working with AR15s for the past few years and love'em. If you have any questions definitely let me know. My name is adam roth. I am really into ARs and i have been reading through this forum. Looks pretty dead but there is some good info on here. I own prolinebowstrings.com so if anyone has questions about bows or strings just let me know. Hey, I'm Terrey Thompson. I just joined this forum to learn more about gun safety and what kind of firearms I should consider buying. Joined up to learn as much as I can about shooting and ARs. Hey all! Hello Everybody! I grew up hunting in the Piney Woods of East Texas and now find myself living on the Mississippi Gulf Coast. Being a former armor in the U.S. Army, I learned the ins and outs of the AR-15 aka M4! I started with an Olympic Arms, then picked up a S&W M&P 15 and recently picked up a LWRC DI. All of which where chambered in 5.56. My son is 16 and we have been going out a lot lately looking for deer, I let him run his .308 and I just tag along as a spotter with my AR incase we come across some hogs. Hitting the woods with Black Hills Ammo 77 grain Tipped MatchKing in 5.56.